The Israeli government sticks to a policy of neither confirming nor denying whether it has an atomic arsenal of its own. However the country has at least 80 nuclear warheads, according to the latest data complied by the Stockholm International Peace Research Institute in June 2014. The US, Russia, China, Britain, France, and Germany are conducting talks aimed at an agreement to end Iran’s nuclear weapons programme in return for a lifting of sanctions and asset freezes. They have set a deadline for an agreement of the end of June. 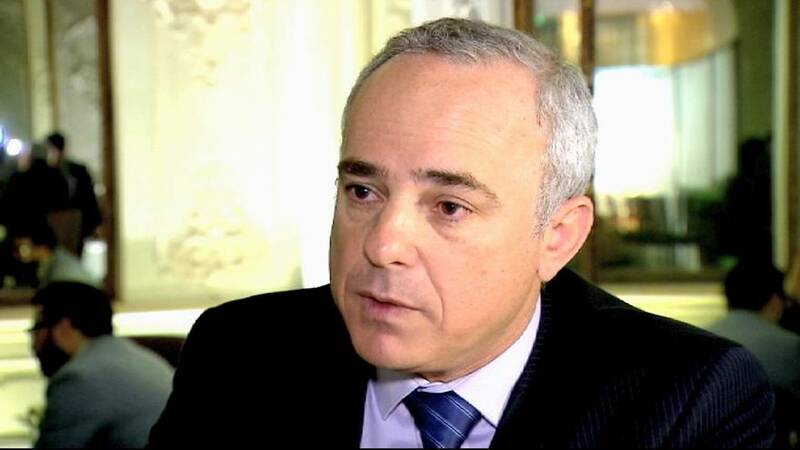 Euronews correspondent James Franey spoke to Israel’s Intelligence Minister Yuval Steinitz at the Munich Security Conference on February 8, 2015.
euronews, James Franey: Dr. Yuval Steinitz, Israeli Minister of Intelligence. Thank you very much for being with us. Lots of talk here at the Munich Security Conference about the Iran nuclear talks. What’s your take on the way things are going? Israeli Intelligence Minister Yuval Steinitz: Look, we are very disturbed. We think that Iran should not remain or become a threshold nuclear state. If Iran will remain too close to the bomb, two things might follow. First, sooner or later, they will produce a bomb. Exactly like what happened after (a) similar agreement with North Korea a few years ago. And second, other countries, other Sunni countries in the vicinity will demand it as well. So instead of stopping the Islamic nuclear arms race, you will have several nuclear threshold states in the Middle East, in the volatile Middle East, in the Islamic world and you know what will be the end result. euronews: How close are they to the bomb in your opinion? Yuval Steinitz: I don’t know. There are still very serious gaps on a variety of issues. We are following very closely the negotiations. We think the overall approach from the beginning should be different. If Iran is getting rid of the sanctions. If Iran is being recognised as legitimate members of the international community. If Iran’s civilian nuclear facilities are getting international recognition. Iran should give something in return. Iran should dismantle its enrichment facilities in order that the world will be confident that they cannot produce a bomb and that they are not even close to the capacity to produce a bomb. euronews: Now the Iranians will say they’ve been subjected to quite tough checks already. Yuval Steinitz: Look, I can say only this: in the last ten or fifteen years the world has signed two agreements with two rogue regimes. Brutal, dangerous regimes that were trying to develop nuclear weapons. One was signed with Libya in 2003; the other with North Korea in 2007. The agreement with Libya was about dismantling their entire infrastructure that was under construction still. The agreement with North Korea was mainly about freezing most of the elements and putting better supervision or inspection methods. We know what was the result. North Korea did developed nuclear weapons three or four years after the agreement. So we have to learn something from recent history. The agreement with Iran in order to be a good, satisfactory agreement should be closer to the Libyan model than to the North Korean model. If Iran will get the weapon, it is going to create a new dangerous world. It will be the first time that Islamic zealots will get those dangerous weapons. And this is really not just about the future of the Middle East or Israel; this is about the future of the world. euronews: The Israeli government, in a way, has been ‘the Boy that cries Wolf’ so many times over the past few decades. If you look at your prime minister’s book, Fighting Terrorism – he predicted that Iran would have a bomb within three to four years. That book came out in 1995. So I’m just wondering: why should people inside that room and the international community believe the Israeli predictions when they’ve been quite a way off so many times? Yuval Steinitz: I think that Prime Minister Netanyahu predicted that Iran might produced nuclear weapons unless the world will do something about it. And unless there will be many difficulties on the way. So firstly, it is good that Iran is not there yet. This is not bad. This is good that it is taking time. Euronews: But you’ll admit that you’ve repeatedly made these kind of predictions. I mean, Shimon Peres when he was foreign minister told French TV in 1992, I think it was, Iran will have the bomb by the end of that decade. Yuval Steinitz: Then the Iranians were saying that they had some disturbances and they had some computer disturbance and some difficulties and they found some ingredients….I don’t know what they were speaking about, but they had many difficulties in the past. Still today, they are not far away. And without. Yuval Steinitz: I don’t know. One or two years. It depends. And without the efforts of Prime Minister Netanyahu and without the efforts of Israel in general. But without Prime Minister Netanyahu in particular, without his diplomatic efforts and speeches in Israel, in the United States, in the UN, in Europe, the world would not put such emphasis (on stopping Iran). And it’s actually Netanyahu not alone, but Netanyahu played a key role in awakening the world to the Iranian nuclear threat. Euronews: Just my final question, you raised the issue of speeches in the United States. Prime Minister Netanyahu is planning to go to address the US Congress next month. Do you think it was wise to accept that invitation without consulting with President Obama. Because the United States is one of Israel’s top strategic allies. If not, its top strategic ally. Yuval Steinitz: Nobody, (including) Prime Minister Netanyahu, wants to offend somebody in the United States. We have a lot of respect for the United States and for President Obama. But I don’t know of any world leaders who get an invitation to speak in this forum, the joint meeting of the Congress – the House of Representatives and the Senate – and reject it. So sometimes we might have differences and we have here some differences about the overall approach. What should be the final aim of these negotiation on the one hand? On the other hand, we do appreciate the very strong co-operation and dialogue that we have with all the P5+1, but of course especially with the Americans about this issue. And I am confident that also after the elections in Israel in a few weeks time this strategic alliance, the security cooperation and the friendship…..the deep friendship between Israel and the United States of America will remain so come what may.